When Samuel Foote was buried clandestinely in the cloisters of Westminster Cathedral, he may or may not have been reunited with his missing leg. (In eighteenth-century London it was customary for amputees to be buried with their sawn-off limbs, which were kept embalmed for this purpose.) How Samuel Foote lost his leg is one of the many extraordinary and gruesome elements in the story of a unique character in the most colourful period of British history. Samuel Foote, although forgotten now, was a major figure of Georgian London. Friend of Johnson, Garrick, Fielding, Goldsmith, Sheridan, Boswell and Franklin, Foote was the most famous and the funniest man in England. He first made his name by writing a bestselling pamphlet about the family scandal that culminated in his uncle’s murder (by another uncle). This story captivated coffee-house London and helped him escape the debtors’ prison in which his decadence and debauchery at university had landed him. Foote’s subsequent life was full of infamy, controversy, and violence, ending chaotically in two notorious trials encompassing bigamy, buggery, and defamation. But most importantly Foote is now reclaimed as a great actor, dramatist, impresario, the first celebrity impressionist, and, Kelly argues, the singular founding father of the British sense of humour. 2015-2016 West End adaptation, directed by Richard Eyre and starring Simon Russell Beale and Ian Kelly. Kelly's perceptive wit, and interest in his densely theatrical material, makes him an ideal biographer for this pint-size peacock . . . Foote's imprint deserved uncovering. [In this] uproarious account of Foote's career . . . Kelly handles theatrical rumour and apocrypha with great care. 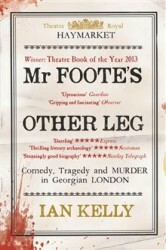 Ian Kelly’s splendid biography of Foote not only makes robust claims for his importance, but makes clear why he disappeared from the canon so rapidly... This thrilling piece of literary archeology should ensure that Foote is no longer a footnote, but seen as an integral part of the development of drama in the 18th century and beyond. In this sprightly and hugely entertaining biography... Kelly writes about him [Foote] with great panache... and has written as fun and lively a historical biography as you could want to read.